Fresh ingredients shine in El Mundo's chicken fajitas; a Best Bite. My quest to traverse the entire menu at El Mundo led me one day last week to their fajita al mojo de ajo, which means "with garlic," with each of your filling choices smothered in slow-roasted garlic. Choose from a coffee & chili-rubbed flat iron steak, Mexican BBQ shrimp, or chicken breast, each grilled to perfection. You have to be hungry to order this dish, though, because it comes as a huge platter of fixings for you to assemble into three fajitas, however you like 'em. El Mundo's chunky salsa fresca. At the top of the platter, at 12 o'clock, there was lovely, fresh guacamole. 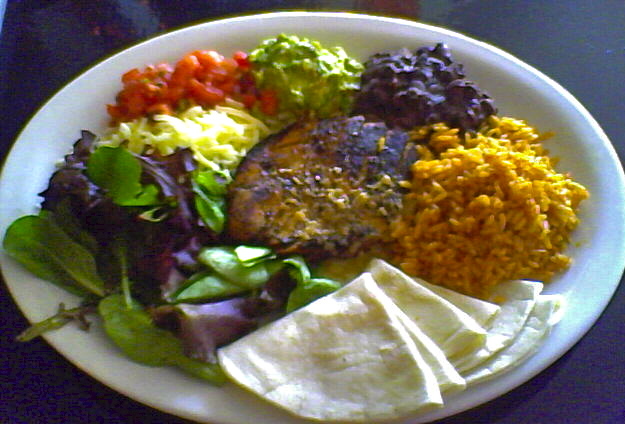 Next was a scoop of mildly seasoned black beans (El Mundo makes a spicy black bean and chipotle dip, too,) followed by a mound of Mexican style rice. In the center of the plate was the star of the dish, a generous portion of nicely seasoned, grilled chicken breast, with a wonderful flavor from that slow-roased garlic, sliced and ready to pile into my tortilla. I ate the beans and rice on the side, between munching down my fajitas, but I think next time I might slip a few beans into a fajita or two as well. This dish has a lot of flavor, and it's a decent value at $16.95. This was the best meal I'd eaten all week long, a real stand-out among the various foods and treats I had tasted all around Provincetown that week, and that's what makes it a Best Bite. Find El Mundo right across the street from Town Hall, at 269 Commercial Street, with a lively bar serving a dozen different margaritas, Mexican beers and a number of specialty cocktails, along with two dining rooms, a nice water view, and outdoor seating looking out over the beach and the harbor. These two Bears thoroughly enjoyed delighting others as they walked down Commercial Street. As thousands of Bears began flocking into Provincetown last week, the atmosphere changed quite noticeably. While other crowds attending various "theme" weeks held in Provincetown throughout the year sometimes raise the stress level here (along with the decibel level, the attitude factor and the drama quotient,) the bears bring a collective sigh of relief from innkeepers, shopkeepers and peacekeepers alike as they take over the town for a week. Waitstaff, cab drivers, merchants and Town Hall bench-sitters all seem to agree... We love the Bears! This group is probably our favorite of all the crowds who join us for a week or so every summer. As a whole, the Bears are a group of considerate, fun-loving, mellow creatures who make us smile when we encounter them walking down Commercial Street dressed in costume for themed parties, or find them splashing in various swimming pools, or when we see them being pedaled around town in the pedicabs at dinner time. 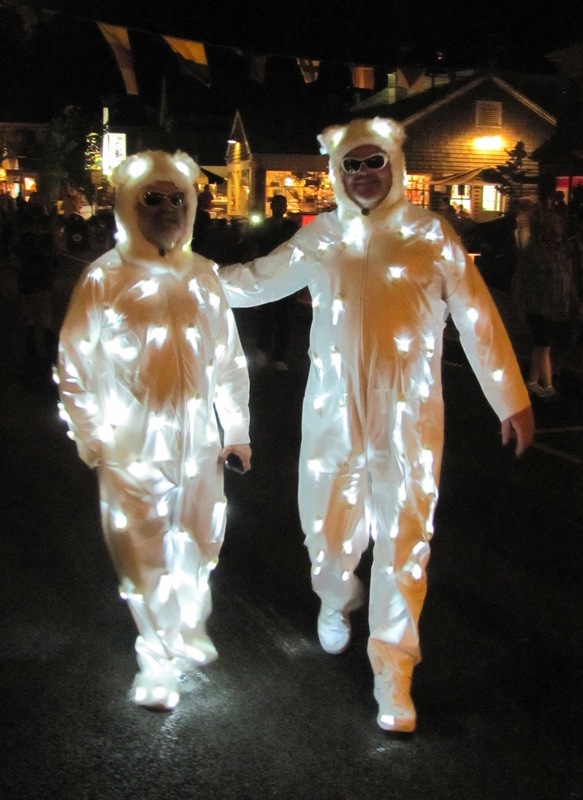 I wrote the other day about special dinner menus for Bear Week, and there's also special entertainment booked just for this crowd, as well as harbor cruises, concerts, dune tours and countless other events. You don't have to be a bear to enjoy bargains in restaurants, comics brought in for this week, or special art displays in many galleries. 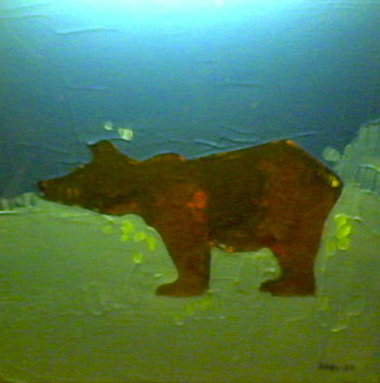 This painting by Trevor was found in a display case outside his new gallery at the corner of Commercial and Pearl Streets. The Lyman-Eyer Gallery, in the heart of the Gallery District, on the edge of Kiley Court, and a number of others, also mounted special shows for Bear Week. Andy cavorted in his Bear suit to raise money for the Soup Kitchen. The Bears show their appreciation for this beautiful little town that welcomes them with open arms by supporting several benefits and fundraisers for community organizations here. This year there was a Pirate Party at the Crown & Anchor to benefit Camp Lightbulb, Provincetown's summer camp for LGBT teens. The Fireman's Ball, held at the Paramount, raised money for our fire department. The Uniform Ball, held at the A-House, raised money for our local Soup Kitchen, and Club Purgatory hosted a Feed The Bears Buffet, also benefiting the Soup Kitchen. 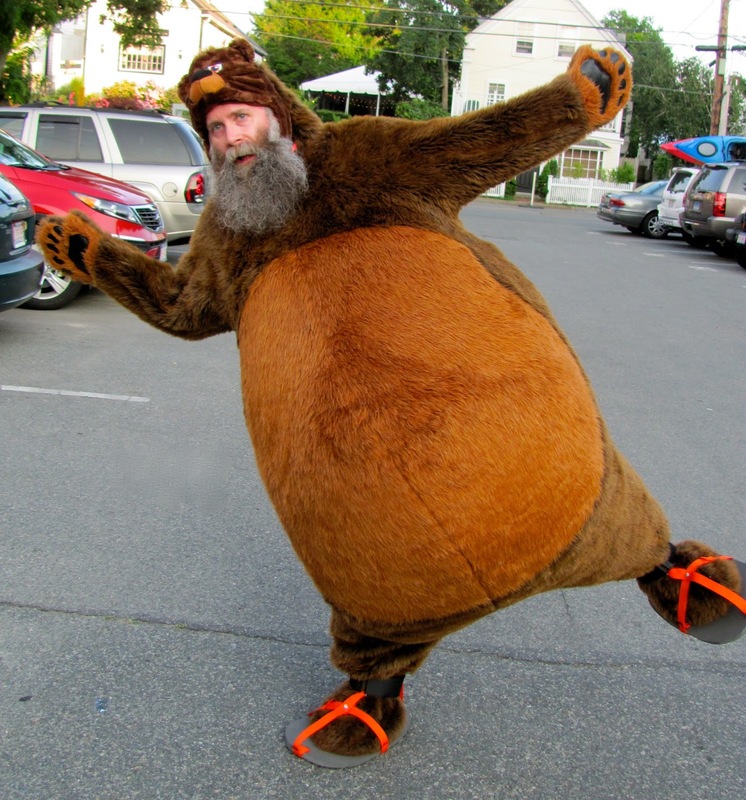 Andy, shown here in his Bear suit, is a New Hampshire Bear who drove down from Manchester and happened to have a bear suit in his car, and realized that he could help herd hungry Bears up Carver Street to the fundraising buffet by donning his Bear suit and bounding around on Commercial Street to advertise the event. This synthetic fur costume (heavy, and hot as hell) has a sort of "beach ball" inside, to give this Bear a big, round belly. Andy pumped it full of air from a tiny compressor hooked up to his car's cigarette lighter, so I would imagine that added a good bit of extra warmth inside. On one of the hottest evenings we've had during this heat wave, Andy spent three hours in this torturous suit, helping to raise money for our Soup Kitchen. It hadn't been pre-arranged. No one asked him to do it. Andy just saw an opportunity to help, so he stepped up. We thank him, and all the other Bears, Cubs and Otters who help to raise money for our local service organizations every year. With just a couple of days of official Bear Week left, the group begins packing up their new T-shirts and assorted mementos for the journey home, wherever they all might live. We blow them a kiss, and wish them a safe journey home, and hope to see each one of them in Provincetown again, soon! Sal's roasted duck with cranberry marsala glaze is one of my favorite meals. Bears (and the rest of us, too) are flocking to the Far West End of Provincetown for dinner at Sal's Place, at 99 Commercial Street. This charming waterfront restaurant is perched on the old Union Wharf, dating back to the height of Provincetown's early fishing and whaling days, around 1830 or so. Sal's Place serves homemade Italian food in a vintage, historic building with a water view from the air-conditioned dining room, and there is also outdoor seating on the old wharf, with a stunning, panoramic view of Provincetown's magnificent harbor. To celebrate Bear Week, Sal's offers a five-course meal with a choice of minestrone or kale soup, followed by a mesclun salad, and your choice of a meaty pasta dish, stuffed flounder or roasted duck. An extra side dish of pasta or fresh vegetables is also included, along with a choice of three desserts. This very robust Bear meal is only $39, and there's also a three-course Cub meal for just $29. I chose my dinner from the Cub menu, which starts out with a bowl of minestrone soup. I ordered the roasted duck, served with a cranberry marsala glaze, and accompanied this night by multi-colored peppers and green beans. This perfectly roasted duck happens to be one of my favorite entrées on Sal's menu. Sal's Gelato Bear is a delightful, very chocolaty dessert. For dessert, I just had to order the Gelato Bear, which is specially made for Bear Week. It is a big scoop of a rich, dense, really chocolaty Italian ice cream decorated with white and dark chocolates molded to make the face and ears of the bear. Chocolate drizzles and fresh strawberries completed this dessert, which was deeply flavored and very satisfying. Wonderful food, the cooling breeze on the edge of the water, and the splendid view of the harbor, make dinner at Sal's Place a memorable event. Phone Sal's Place at 508 487-1279 for reservations, or you can visit their website at salsplaceofprovincetown.com 24 hours in advance to reserve by e-mail. A number of restaurants have specials for Bear Week, so watch for these bargains. Learn about the tidal flats surrounding the West End breakwater. Outdoor activities (like walking out on the breakwater in the West End) can lead us to discover a number of plaques that can give us insight and all kinds of information about the area around us. The Provincetown Center for Coastal Studies and the National Park Service have each provided a number of these educational displays throughout Provincetown and the surrounding area, and these can can give visitors a look into a great many things that are easily spotted on the surface, as well as the unseen workings of the natural world around us. When the tide goes out, acres of sand are exposed on either side of the breakwater. Twice a day, as the water recedes, the tidal flats become visible, attracting many people who will go out exploring, walking between tidal pools looking for shells and other treasures. These beachcombers will come across birds, mollusks, hermit crabs and many other creatures they they may know little about. This plaque, found near the head of the breakwater in the Far West End of Provincetown, teaches us about several species of shore birds commonly seen on the tidal flats, as well as other animal life that can be found here at low tide, and also about microscopic life in the sand and the water, keeping this fragile ecosystem healthy. Read these plaques as you find them along the shoreline, at the Provincelands Visitor Center, and at the head of MacMillan Pier, and learn more about the workings of the amazing natural world in this beautiful jewel we call Provincetown. We are grateful to the Provincetown Inn for restoring this plaque after many seasons of exposure to the elements had damaged it beyond readability. Now we can once again learn about the incredible variety of creatures inhabiting the area, in the sky, in the water, on the sand, and even below the surface of these remarkable tidal flats. Folks cool off at the West Vine Town Landing, next to Captain Jack's Wharf. With this year's warmer-than-usual temperatures, it can be quite important to find ways to keep cool, like spending a little time in the water. The folks in this photo are cooling off at the Town Landing found at the foot of West Vine Street, next to Captain Jack's Wharf. Town Landings are found in spots all along Commercial Street, providing public access to the beaches on the edge of Provincetown's magnificent Harbor. There are footpaths and walkways leading to harbor beaches as well. Each neighborhood has a Town Landing or a walkway to the harbor, and some areas have several. Use any of these to go for a walk on the beach (tide permitting) or to go for a swim, or to launch a canoe, kayak or raft. Town Landings can accommodate larger craft like rowboats and small motorboats, while the boat ramps at Flyer's and at the West End parking lot can accommodate bigger boats. Last Saturday we hit 90 degrees in Provincetown, which is about 13 degrees higher than normal for this time of the year. Even at that, we were still a few degrees cooler than the folks in Boston. We've got a break in the heat for a couple of days with cloudy skies and some rain, which gave us a high today of 75 degrees at 8:45 this morning, an unusual time to mark the day's highest temperature. Tomorrow looks to be even a bit cooler, but temperatures will soon climb to the mid-80s again, and an over-all hot summer has been predicted, so make sure you keep yourself feeling well and healthy by cooling off a bit when the mercury rises, and be sure to drink an extra glass or two of water over the course of each warm day. Taking in a movie is a great way to get out of the heat for a couple of hours. It's nice and cool in the Waters Edge Cinema,. at 237 Commercial Street, on the second floor of the Whalers Wharf. Besides two other films showing this week you'll find 20 Feet From Stardom playing for an extended run. This is the film that ran away with the Audience Award at this year's Provincetown International Film Festival a few weeks ago. Read my July 9th post about this terrific movie, watch the trailer for 20 FEET TO STARDOM, and check the blurb on the right-hand side of this page to find the updated schedule for the coming week, through July 18th. One way or another, find a way to cool off and enjoy the exceptionally warm days ahead. "Compass grass" traces circles around its stem in continuous gusts of wind. 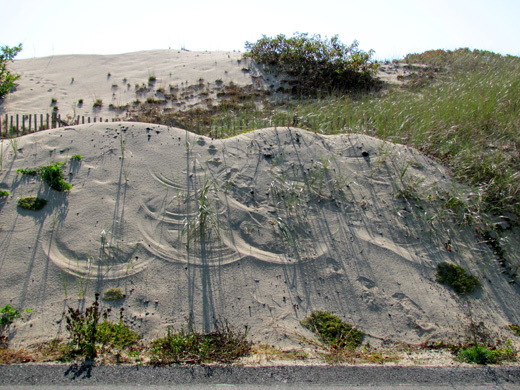 Beginning back in the 1960s the National Park Service started a program that would help to control the erosion of beaches and dunes in the Provincetown area by planting rows of beach grasses in spots exposed to strong winds or to waves along the shoreline. These grasses were planted to help to stabilize the dunes against the force of the wind, and to keep the beaches from eroding under the constant pressure of waves and tides rolling in along the shore. These grasses also help to defend the beaches from serious storms that can carry away acres of sand from the shoreline overnight. The grasses on the dunes and sandy hillsides surrounding Provincetown are ammophila breviligulata, or cape American beach grass. This grass can grow quite well even in arid locations, clinging tenaciously to sandy hillsides in even the worst of conditions served up by Mother Nature. It's been planted all along the fore dune (the "front" dune, on the edge of the beach) at Race Point and Herring Cove beaches as well, to help the shoreline resist the wind and the waves that would carry away tons of sand from these areas every year if it weren't for the erosion control provided by these hardy grasses. The beach grass proliferates on its own by sending out a tremendous root system well below the surface, starting new shoots from rhizomes growing among these roots. A rhizome is a kind of chunky root that sends "fingers" growing in different directions, the way ginger grows. The nodes of the rhizome can each start a new clump of grass growing by sending out a runner under the sand, and blades of grass can spring up several feet from the original culm (stem) and will sometimes show up as a straight line of new grasses fighting their way up to the surface from a root stretching out far below the sandy, windswept hillsides. After some time these single blades of very tall grass produce a few more stems, forming a little clump of grass as seen in the photo above. These grasses bend in a strong wind, and the tips of the grass often brush against the sand. When the wind blows in steady gusts, the tips of the grasses move with these gusts, often tracing a circle in the sand around these sturdy stems. long, slender shadows cast by single stems of grass at just the right time of day. We'll sometimes see hillsides covered with graceful circles surrounding small bunches of beach grass, creating a lovely bit of natural art in the sand. These circles remind us of lines traced by a compass, with one point fixed in the center while the other point rotates around it. With each gust of wind, a tall blade of grass will trace a bit of a circle. As the wind shifts, another part of the circle will be etched. Winds gusting steadily through the day can eventually carve deep circles in the sand. And that is how these individual clusters of "compass grass" got their nickname. created the sounds of some of the most famous bands of the 21st century. You've may never heard of Darlene Love, Merry Clayton, Lisa Fischer, Táta Vega, Judith Hill or Claudia Lennear, but you've seen them any number of times, and you've certainly heard them if you've listened to any kind of popular music over the last twenty years or so. They sang the backup vocals for some of the biggest stars and bands in the music industry, like Bruce Springsteen, Stevie Wonder, the Rolling Stones, Bette Midler and Sting, who all appear in this splendid movie, paying tribute to these selfless women who made these stars shine both on the stage and in countless record albums through the years. 20 Feet From Stardom is director Morgan Neville's brilliant and loving tribute to the women whose amazing voices and talents helped to raise others to stardom while they themselves stood just outside the beam of the spotlight. This fascinating film earns a standing ovation as it takes us into the lives of these remarkable women who created the sound and character of some of the best bands to ever record their work or to appear on stages around the world. It was the winner of this year's Audience Award at the Provincetown International Film Festival a couple of weeks ago, and is now playing around the country to packed houses whose audiences can't get enough of the great music and the remarkable stories of these extraordinary women. The Rotten Tomatoes movie review website gives it a 98% approval rating (Gone With the Wind got a 96) and Ty Burr, Boston Globe critic, gives it a five-star rating. See the trailer by clicking on the movie title in red, below. This thoroughly delightful film has been brought back to PTown by the Provincetown Film Society and will play at the Waters Edge Cinema, at 237 Commercial Street, on the second floor of the Whalers Wharf, beginning at 1:30 this afternoon and running through Thursday, July 11th. Check the schedule below. Seeing this movie is also a great way to get out of the oppressive temperatures outdoors, and cool off during this heat wave. You can always check the schedule at Waters Edge very easily by dialing 508 487-FILM. It's easy to remember, and it will always lead you to the very best in independent film, now available throughout the year in Provincetown thanks to the efforts of the Provincetown Film Society and their ongoing campaign to buy the Waters Edge Cinema, where they continue to support many films that won't be appearing anywhere else within a hundred miles of Provincetown. Support this wonderful theater, and see this astonishing, uplifting film sometime during the coming week. 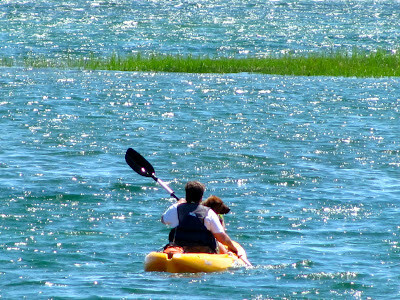 A dog and it's human companion are kayaking on a very high tide in the marsh. 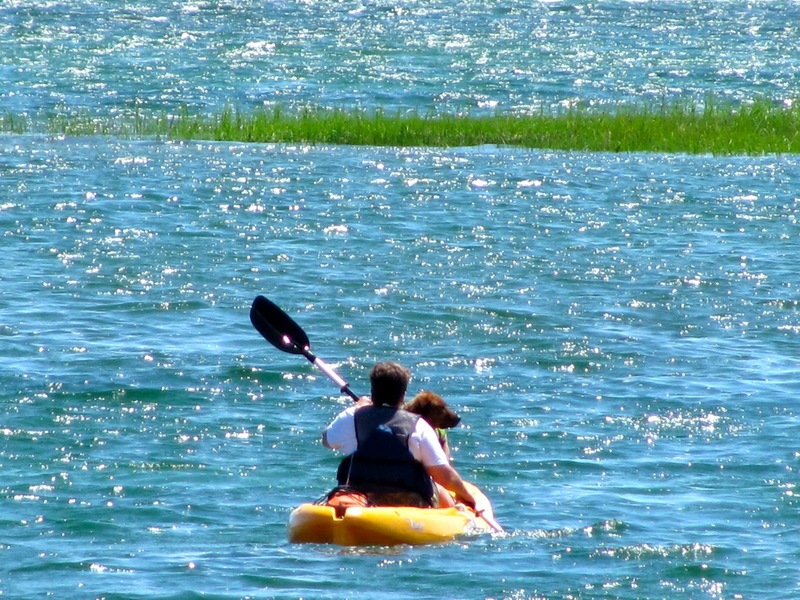 This kayaker and dog are enjoying a truly gorgeous day on the sparkling waters near the breakwater in the Far West End of Provincetown. In 2010, Dog Fancy magazine said that PTown was the most dog-friendly spot in the country. Merchants all around Provincetown put out bowls of water for thirsty dogs, and we've got a bubbler (that's Yankee for "water fountain") for dogs and their humans in front of Town Hall. We've got a pet resort on Shank Painter Road, we have a pet appreciation celebration, and we have a cage-free, no-kill animal shelter that operates on fundraising events and contributions from the public, staffed almost entirely by volunteers. Provincetown has 15 dog-friendly restaurants with outdoor canine dining areas, and 30 guest accommodations, cottages, campgrounds, hotels and inns accept pets. Dogs can go sailing, swimming or whale watching with Captain Rory and her crew aboard the Moondance II. They carry life vests on board for small and medium-sized dogs who might not be great swimmers. Dogs visiting Provincetown and the surrounding area can get their hair done, have a massage, and have their portrait done by half-a-dozen artists and photographers. They can meet new friends in doggy daycare. They can take a narrated tour of the harbor on the Viking Princess. Dogs can fly with their humans between Boston and Provincetown for $10, and leashed dogs can take the fast ferry between Boston and Provincetown for free. Find more dog-friendly information on the website for the Pilgrim Bark Park, PTown's quarter-million-dollar dog park and playground that's still fundraising for more improvements. Dogs who take the tour of the town on the Provincetown Trolley get a treat at the end of the tour, and those walking by the trolley while it's parked in front of Town Hall can stop and get one, too. Dogs who visit Seamen's Bank get a treat from the tellers while their humans get a lollipop. In what other place on the planet are dogs not only allowed on public accommodations and in public buildings, but are even encouraged to visit?